The best person to answer questions about your roof system is a reputable, licensed roofing contractor; however there may be questions as to the necessity of hiring a contractor. The information contained in this article may help the homeowner decide when it is necessary to consult a professional. Often, problems with a roof are not noticed until leaking or other serious damage occurs. Periodic (twice a year) inspections of the roof can often reveal problems before expensive damage happens. If leaks do occur it may not be necessary to completely replace the entire roof. Leaks can be a result of loose flashings or a just a section of damaged roof, and can be repaired at a much more reasonable cost than replacing the entire roof. Roofing repair or replacement is not a do-it-yourself job for average homeowners. Professional roofing contractors are trained to safely and efficiently repair or replace roof systems, and often offer warranties on materials and workmanship. 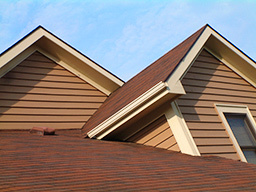 A common question asked by homeowners is how long does a typical roof system last? Most new roofs are designed to provide useful service for approximately 20 years. There are some roof types, such as slate, clay tiles and certain metal systems that can last for much longer. They are quite a bit more expensive than traditional asphalt shingles and may require specialized installation. There are a number of factors that determine the actual life span of a roof; these factors include climatic and environmental conditions, proper building and roof system design, material quality and suitability, proper application and adequate roof maintenance. Probably the most important question asked about roofing is regarding the cost of a new roof. The price of a new roof varies widely and depends on a number of variables. Among these are the materials selected, the contractor doing the work, location of the home or building, local labor rates and the time of year. Obtaining three or four proposals from reputable roofing contractors in your area will give you a good idea of price. Keep in mind that price is only one factor, quality of materials and workmanship should be considered.